Get ready to say goodbye to 4G and hello to 5G. While the shift will not be overnight, it is expected to take place in the next five years and will have significant implications for how we work and play. Kaleido Insights’ methodology for analyzing emerging technology assesses the impacts on humans, on businesses, and on ecosystems at large. As part of our ongoing coverage, we’ll be analyzing a series of topics using our methodology to help business leaders first understand, and then see beyond the bright and shiny and cut right to what matters. In each post, all Kaleido Insights analysts conduct a joint analysis session around one topic (e.g. technology, event, announcement, etc.). In this post, we analyze the ecosystem impacts of 5G. 5G adoption is expected to occur at a faster rate than 4G adoption did, with North America, the Asia-Pacific, and Western Europe at the forefront of this change. In North America, 25% of mobile subscriptions are expected to use 5G by 2022, just four years from now, reports Business Insider. Several 5G pilots are currently underway, spanning major carriers across the globe. Some of these pilots are being sponsored by telecom giants Verizon and AT&T in the United States, Telefonica, in Spain, and French regulator Arcep. The most visible 5G pilot at the time of writing is currently being operated by Korea Telecom (KT) with the Winter Olympics in South Korea. Transmission speeds are expected to be 1,000 times faster than standard LTE networks, with some of the benefits allowing broadcasters to air events in Ultra High Definition (UHD; four times higher resolution than standard HD) and 360-degree virtual reality (VR) cameras for home viewers. But these are still tests, and the tests haven’t been rolled out to consumers at large. This reality, coupled with costs and technical hurdles, could ultimately slow 5G adoption. In terms of costs, base stations and radio towers that phones talk to will need to be upgraded and installed before 5G’s potential can be realized. In the U.S. alone, costs for this are expected to peak at $23 billion in 2023 reports CNET. Key technical hurdles identified last year in a survey conducted by Tolaga Research and sponsored by InterDigital include densification (increasing the number of cells in an area), finding the right small cell partners, and offload strategy. Another factor in slowing the realization of 5G is the disconnect between how quickly the government moves in relation to the industry. It only takes an hour to install a smart cell, yet it can take a year or more to receive a municipal permit to install one. If a government is unable to keep up with carriers and tech partners, 5G won’t scale quickly. Another shift will occur with the types of mobile devices consumers use. As the switch to 5G takes place, 4G phones will become obsolete, as they won’t be compatible with 5G (just as 3G phones weren’t compatible with 4G networks). This means that consumers will need new 5G-enabled devices. Companies like Nokia and Sony Mobile are already developing these 5G phones. Qualcomm is also making headway in this area through partnerships with phone manufacturers and carriers. They expect to have 5G devices available by 2019. This year’s Mobile World Congress will likely bring another wave of related announcements. And of course carriers are moving towards implementing 5G. Coming out of Verizon’s eleven-city pilot from the past year, the company says it plans to begin offering 5G services to between three and five residential markets this year. AT&T reports that it will bring commercial 5G services to 12 cities this year, that it upgraded networks in 23 cities, and that it completed tests in a few cities. Smart grids and smart factories. 5G, combined with “network slicing,” which allows network resources to be allocated on demand, is being tested with traditional power and factory models. In 2017, China’s Huawei demonstrated a network slicing application for the smart grid, showing how 5G can be used to restore power in 300 ms. It upends traditional models in its ability to be secure, reliable, and high-performing at a low price. Similarly, Ericsson and China Mobile jointly showed how these technologies provide cost-effective, real-time, and low-energy solutions for various manufacturing scenarios. Verizon used the 2018 Super Bowl as a 5G testing ground, claiming fans used 18.8 TB of data in and around the stadium– equivalent to a single user binge-watching HD video for 435 straight days Image from FierceWireless via Pixabay. In order for 5G to come to fruition, partnerships are emerging between telecom operators, chip manufacturers, and original equipment manufacturers (OEM). Many prominent pilots or demonstrations entailed collaborations between operators and OEMs, such as that between KT, Samsung, and Intel with this year’s Winter Olympics in South Korea and Verizon and Samsung at this year’s Super Bowl. In addition, Qualcomm recently announced that they’re adding 19 global operators and 18 OEMs for 5G. 3GPP is a telecommunications standards group, where major carriers and companies engaged in chip and device making are collaborating with goal of reaching a standard version of 5G. In December 2017, they defined an architectural standards for 5G called Release 15. But not all of the big players are part of this group. Verizon, for example, plans to begin offering its own version of 5G service to residential customers, which differs from that of the 3GPP standards group. Another relevant group is the Internet Engineering Task Force (IET). They are the premier internet standards body that is comprised of an international community of network designers, operators, vendors, and researchers who are concerned with the evolution of internet architecture and a smooth operating internet. One of their focal areas is IoT. While everyone can agree on the need for standards to enable 5G, the ecosystem has yet to surface a dominant standard of enablement. Like IoT, standards themselves will likely fragment based on application. Alteros SuperTower. Image from Business Insider. 5G’s impacts on sustainability and society involve gaps between rural and urban areas, and security and privacy concerns. However, companies like Google, Apple, and Facebook will demand 5G development in rural areas. 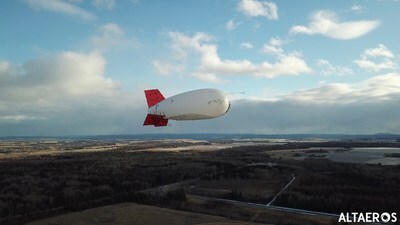 A partnership between Ericsson and Altaeros successfully deployed a multi-sector LTE base station on a SuperTower (industrial blimp) in late 2017 in rural Maine. They successfully provided the test area with broadband speeds with streaming videos. Security. In terms of security, 5G adoption has ramifications for medicine, autonomous cars, and smart grids, to a name a few examples. The technology encompasses many of the same security threats as 4G, with Cisco identifying five primary protections to focus on: preventing threats, stopping and fixing advanced malware, detecting anomalies, incorporating DNS intelligence, and making threat intelligence paramount. As discussed in the Competitive Shifts section of this article, Blockchain could potentially mitigate some of 5G’s security issues. Privacy. On the flip side of security, are privacy concerns. Many of these concerns already exist with 4G technology, such as using unique identifiers that are linked to individual users and stealing user data. The implications are that private citizens could be tracked in terms of their everyday behaviors — the activities they engage in and where they take place. Whether a nationalized 5G network is implemented or not, the speed at which the government operates is of concern. If government municipalities want to attract new business from companies like Amazon, they will need to greatly expedite their one year plus approval timeframe for smart cells. Unless this process can occur significantly faster, everyone will lose in terms of costs, growth, and efficiencies — municipalities, businesses, and consumers. Specific international led efforts include: China’ commitment to 5G by 2030, India’s Department of Science and Technology makes focus on adoption, and the EU has put forth a roadmap of 5G adoption within the region. 5G has the potential to offer society a new way of living — a way of making what seemed like a far off vision of the future occur in the next 5-10 years. Yet, the technology still faces numerous barriers, most notably: the costs of upgrading and installing base stations, a variety of technical hurdles, the pace at which government can approve smart cell permits, and ongoing concerns over security and privacy. The end result of 5G: Intelligent ecosystem of connected devices and people, enabling autonomous systems to self-operate.